Hilton Head alumnus David Adams (state record holder, 14:37) looks back at running in high school and college, along with life now. Spring Valley alumna Kate Niehaus looks back at her high school and college experiences. Niehaus also gives insight on what she is currently looking to achieve. Irmo alumnus Scott Wietecha talks about his high school career, college and the present. The South Carolina Track and Cross Country Coaches Classic announced today going forward starting in 2013 cross country season all Coaches Classic meets will be renamed The Bob Jenkins' Coaches Classic. Dorman alumnus Ryan Jank recaps his running career and what he is doing presently. CLEMSON – In one sense, the Geer family will have come full circle by the time son Matthew hands the game ball to the referee next weekend, prior to the start of the annual Shrine Bowl football game in Spartanburg. Porter Gaud's Brent Demarest finished 25th out of 39 finishers at Foot Locker Nationals earlier today at Balboa Park in San Diego. Mauldin alumna Megan Fischer Weis talks about running and her present part of life. 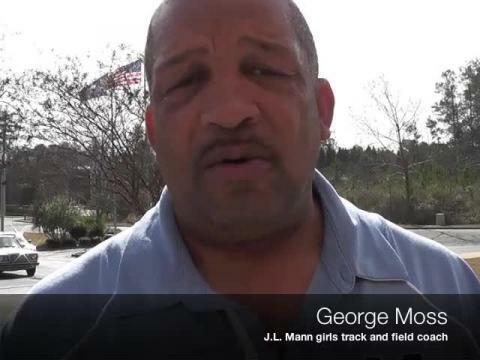 Gaffney track and field coach Aaron Anderson died Tuesday night, the school's cross country coach Bill Conley told scrunners.com. Green Sea-Floyd alumnus Calesio Newman (2005) talks about the present and looks back at high school and college. Mann alumnus Brandon Bartholomew talks about high school running, the college level and what he is doing now. Bartholomew lives in Sweden. The South Carolina High School League has chosen Lower Richland as host venue for the state track and field championships in May. The meet was previously held at Spring Valley. Chesterfield alumnus Craig McPhail talks about his high school and college days of running and the present. Ridge View sprinter SheKara Martin talks about choosing Auburn as her college choice. COLUMBIA -- Longtime coach and SCTCCCA Hall of Fame member (2006) Kenneth Fitzroy Sandiford (C.A. Johnson, Allen University, Voorhees College) died Wednesday. Lexington's Blake White talks about committing to Winthrop and joining high school teammates Colby Coulter and Drew Harris as an Eagle. Greenville Tech Charter's Ben Sessions talks about his decision to attend Spartanburg Methodist College. Sara (Young) Lannom talks about her track and field career and current part of life. Spartanburg's Nate Gordon talks about commiting to Georgetown. Coming later this week: Mann's Laura Miller talks about committing to Furman. I started to bonk on Saturday at around the 17th mile. Part of me worries how the extra six miles will affect me on race day, but this is my first marathon, so I’m going to focus on mentally preparing myself and maintaining a steady pace when the day comes. Spartanburg distance runner Evie Tate talks about her college choice and the 2013 outdoor season. Database top returners for boys 100-meter dash from 2012 results. More top returners will be released leading up to outdoor in March. A look at this weekend's meet in North Carolina. From here on out, each week will rotate between a 20 mile long run and a recovery week. Because I ran 20 miles at the Kiawah half-marathon last weekend, this week is a step-back week. The SCTCCCA Coaches Classic meet is this Saturday at Lower Richland in Hopkins. Online registration closes at 11:59 p.m. Tuesday. Database top returners for girls 100-meter hurdles from 2012 results. More top returners will be released leading up to outdoor in March. SCISA distance runners Logan Morris (Spartanburg Christian) and Brent Demarest (Porter Gaud) were named 2012 runners of the year by Gatorade. Lawrence Johnson, director of the Clemson University track and field and cross country programs for the past five years, resigned today. Riverside distance runner and captain Thomas Garrigan talks about his career as a Warrior and the future as he will attend Anderson University starting in the fall. Northwestern jumper Julisa Tindall talks about her commitment to College of Charleston and final high school outdoor season. Meeting scheduled for Saturday at high school league office in Columbia. Database top returners for girls 1,600-meter run from 2012 results. More top returners will be released leading up to outdoor in March. COLUMBIA - The South Carolina Track and Cross Country Coaches Association announced three as hall of fame inductees for 2013 outdoor season. Database top returners for boys 1,600-meter run from 2012 results. More top returners will be released leading up to outdoor in March.